Tonka, and Vetivert which blend together when put in the bath, creating a smoky scent. I smell sandalwood, but i’m not positive there’s any in here. There’s a smokey note in here. I like it, because it’s unexpected. And Dusky Purple-Grey water. With silver sparkles. Why not? Also at this video link below see my video of The Experimenter in the tub, what a show this thing puts on. Here’s a giant one below that they had on display on opening day at their first Lush Oxford Street’ superstore Creative Showcase. 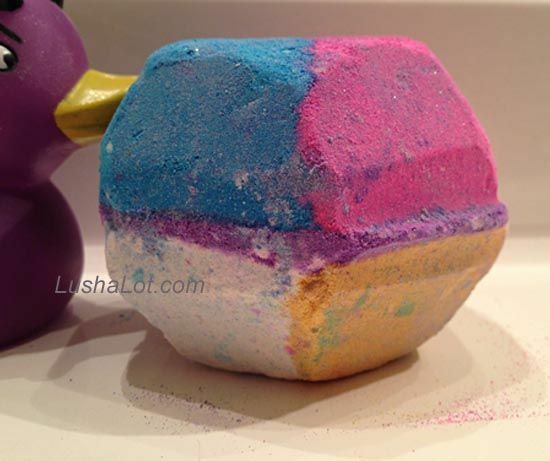 Posted on August 23, 2015 by Lushalot	• This entry was posted in Bath Bombs, Lush Oxford Street store exclusives, New and tagged experimenter, halloween, Halloween 2015, lushwintertime2015, oxford street, the experimenter. Bookmark the permalink.